Orihime : is that really Kurosaki-kun? Ichigo ‘awakens,’ and the force throws Inoue back. It wasn’t a woman’s voice (not sure). He mumbles he is hearing a woman’s “what to do”? Then, it starts from a collection of pics. Then it finishs with that. Somehow, this chapter has very little conversation. Ulquiorra get caught by Ichigo and his left arm is torn off. The color page is Rangiku. 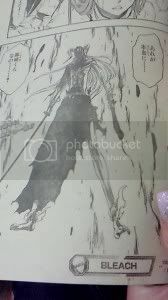 Ulquiorra is still alive even though he lost his arm.